The Postal Service is in the process of educating employees on recognizing suspicious packages and training them on the protocols to follow after one is identified, as the mailing agency’s law enforcement arm is playing a key role in the investigation of a series of mail bombs discovered in recent days. USPS’ Postal Inspection Service has helped screen and identify at least some of the seven packages sent to Democratic lawmakers and officials, as well as at least one media organization and actor Robert DeNiro. Under its Dangerous Mail Investigations Programs, the inspection service responds whenever a mailing may cause harm to postal employees. All of the packages were sent in similar manila envelopes with six “forever” stamps, demonstrating they were sent through the Postal Service. Inspectors are trained to recognize “common characteristics” of suspicious mail and to deploy “state-of-the-art” equipment, such as portable X-ray machines. 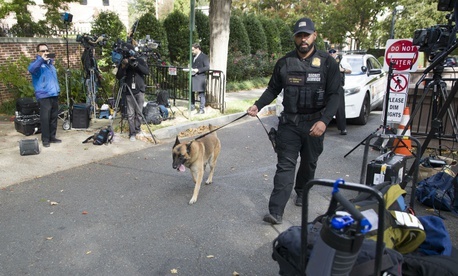 The inspection service would not comment on any specifics of the current mail bomb probe, noting that any details on its procedures and operational protocols could compromise its methods. At a press conference in New York City, FBI Assistant Director in Charge William Sweeney said the bureau is working is "shoulder-to-shoulder" with PIS and its other law enforcement partners. The FBI has sent the packages to Quantico, Virginia, for analysis. When the mail bombs first came to light Wednesday, the Postal Service quickly began working to offer employees safety tips though nationwide “stand up” talks. Those verbal messages help postal management distribute information to employees who do not typically report to an office environment with access to email. The talks include advisories that employees always exercise caution when coming across a suspicious package, and to pay special attention to the shape, look, address and packaging of parcels they are sorting. Packages that are lopsided, have stains or discoloration, a strange odor, misspelled word or excessive tape or postage should raise alarms, according to USPS. Employees should evacuate the immediate area of such a package, call 911 and alert their supervisors and the Postal Inspection Service. "There are longstanding established safety and security protocols for handling suspicious mail and packages and we are currently reminding employees of those protocols and providing them with other resources that are available to them," said Dave Partenheimer, a USPS spokesman. "In addition, we are also sharing specific information about this particular situation." The agency immediately began discussing the situation with the American Postal Workers Union, as required by its collective bargaining agreement. Nathan Catura, president of the Federal Law Enforcement Officers Association, praised those involved in the investigation for their "bravery and commitment."